Asics Gel Rocket III Squash / Volleyball / badminton multicourt shoe designed for the athlete who leaps, lands, and makes quick lateral movements. GEL Cushioning System provides shock attenuation during impact phase. Synthetic Leather Upper provides durability and easy care. Removable Sockliner is washable and compatible with ankle support systems. Gum rubber outsole delivers excellent traction on indoor surfaces. 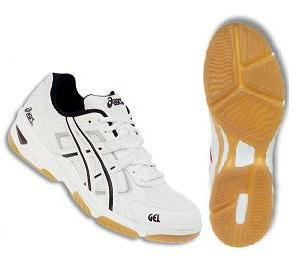 Asics Gel Rocket III Volleyball shoes suitable as ping pong shoes and platform tennis shoes.